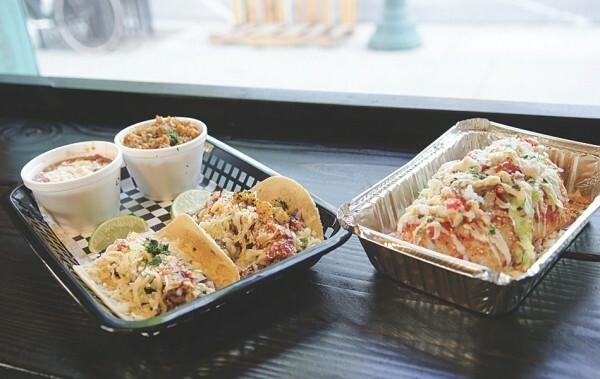 The most common question in Utah County—at least on Center Street—is, “What’s al pastor?” Or so it seems this Saturday night at Blue Pablano, a new-ish taqueria that’s simultaneously urban chic and hole-in-the-wall. Although the menu is straightforward—tacos, burritos and enchiladas stuffed with al pastor, carnitas, chicken, steak or veggies—one BYU student after another is stumped. Many others may be just as unfamiliar with al pastor—a marinated, vertical-spit grilled cooking technique. “Carnitas”: equally perplexing and intoxicating. But Provo-ites are getting a fast education in soulful street-inspired eats with tacos that are as good as it gets anywhere. Owner Bleu Adams and her brother/executive chef Mark Daniel Mason grew up on the Navajo Nation Reservation, whose culinary traditions are paid homage at Adams and Mason’s other restaurant, Black Sheep Cafe. Growing up in the Southwest, the two ate at the country’s finest taquerias. So, in designing Blue Pablano’s menu, Mason set out to “build simple, delicious tacos, where the flavors come out in the exact way he had intended,” Adams says. Throughout the summer, the Blue Pablano taco cart will also serve Granary Row (336 W. 700 South, Salt Lake City), Friday and Saturday, from 6 to 10 p.m.